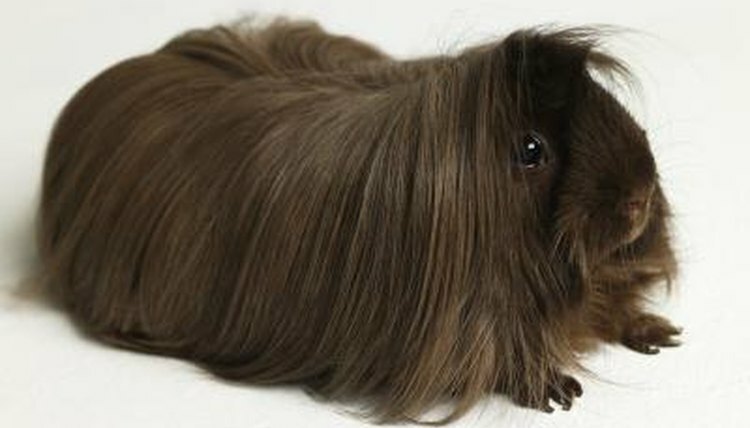 Just like cats and dogs, guinea pigs, or cavies, regularly shed their hair so it can be replaced with new hair. This can occur throughout the year, resulting in a mess in your pet companion's living quarters and your home. Although natural, sometimes shedding might be triggered by health conditions or nutritional deficiencies. To minimize the cleanup and to maintain a healthy, happy pet companion, ensure he's well taken care of inside and out. Just like you, your guinea pig can enjoy a visit to the "hair salon" to keep up his good looks. Regularly brushing and combing your pet companion can reduce shedding. If you start this from an early age, and keep the sessions enjoyable and less than five minutes, your guinea pig will get used to the process, making it easier to keep him still and to get the job done. Long-haired breeds are best combed every day with a wide-tooth comb to prevent knots and mats, while short-haired breeds can pass with a weekly grooming with a soft boar bristle brush or flea comb. A slicker or pin brush also can be used to groom your piggy. In addition to being good bonding time, regularly brushing and combing your pet companion can help you detect abnormalities that can trigger hair loss. For instance, ringworm or external parasites, such as mites or lice, can be to blame. You might notice bald patches, skin crusts or your furry pal might consistently itch and scratch himself. A visit to a veterinarian can set your mind at ease. He can examine your guinea pig, make a diagnosis and suggest proper treatment to get your pet healthy and happy again. Feeding your guinea pig a healthy diet is essential, because nutritional deficiencies can trigger hair loss. Just like humans, guinea pigs need vitamin C, but because they're unable to make this vitamin naturally, it must be supplemented. Guinea pigs need about 25 to 35 mg of vitamin C, and although guinea pig pellets contain vitamin C, this is lost after a few months of storage. To ensure your piggy gets a daily dose of vitamin C, consult a veterinarian about ascorbic acid tablets, which can be broken up and sprinkled over your pet companion's food every day. Before getting a guinea pig, realize that you're taking on a long-term commitment, because these small furry squeakers can keep you company for anywhere from five to seven years. During this time, providing your pet with proper housing, food, toys, grooming, daily interaction and periodic vet visits, are essential to his well being. When it comes to allergies, proteins in the piggy's urine and saliva are the culprit. Minimizing shedding might offer some relief, because hair often helps transmit allergens when you handle your pet.